I have always sketched but was really bad at shape and form. And don't ask me to put color to anything! Now a retired widow I have too much time on my hands. So I joined a decorative art class. Then I discovered you tube classes! 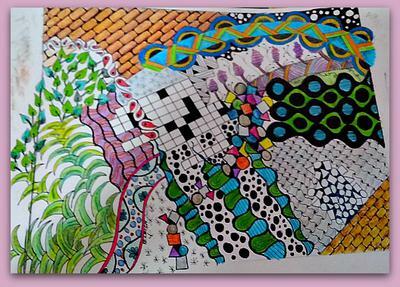 I have fallen in love with Zentangle and am now playing with acrylics and watercolor for backgrounds for the tangling. This is really fun! I enjoy your lessons and blogs. Here is an example of what I am doing. Only been at this a few months but am having fun learning. WOW! You appear to be a very fast learner. I love this piece. I remember a blouse I had that was mainly white with royal trim and a big asymmetrical patch that looked like this type of work. I think this is so fresh and fun! Makes me smile! !